I’ve been in NASCAR jail since Friday afternoon. In case you didn’t know, today is the Daytona 500. I didn’t know this for 24 years. But now that I have Mr. How Sweet in my life, he will never let me forget it. It will most likely be his best day of 2011… depending on who wins of course. He’s been glued to the TV all weekend, watching and re-watching every possible NASCAR special known to man. I even think some tears were shed. But you didn’t hear that from me. He has the diecast cars out to decorate and is wearing a Dale Earnhardt t-shirt from 1991. And there might be a big cooler of beer in the foyer. Needless to say, I’m running far, far away until Sunday evening. And taking some credit cards with me. Since the only food gracing our kitchen this afternoon is 16 pounds of meat and a gallon of ketchup, I wanted to leave him something else to snack on. And since he absolutely loves rice crispy treats, and since I’m so annoyingly obsessed with cake batter flavors, I quickly combined the two. The result is a cakey-flavored crispy treat with tons of sprinkles. Love. original recipe on the back of the cereal box! Chances are these will last less than 30 seconds. I can already see him alternating bites of burgers and crispy treats. Saw this on Pinterest. Tried today for the LSU game. Used halloween sprinkles. Still hot & haven’t tasted them yet, but they are just too cute!! thanks for sharing! Pingback: Cake Batter Crispy Treats – Sprinkle Joy. new zealand,what about a vanilla cake mix? or is that pretty much the same thing? Pingback: Red Velvet Krispie Treats and a Sephora Mascara Review | Pass The Sushi! Thank you so much for sharing! 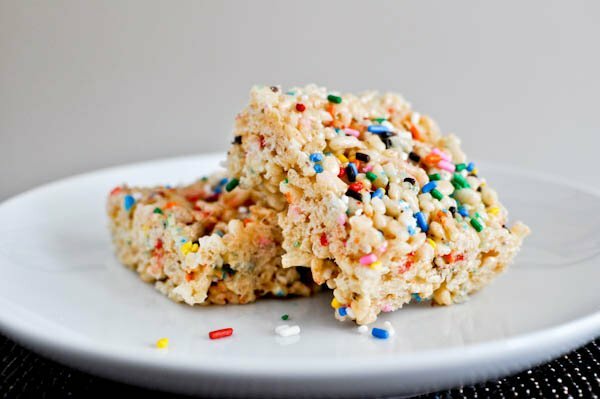 I made these with my own adaptations and posted here: http://thedealgirls.com/2012/02/birthday-cake-rice-krispie-bars/… also shared the link back to you. Thanks for the creative idea!!! Pingback: Batter Up and Fry: Tailgating Treats. "Cake Batter Crispy Treats"
Can u substitute marshmallow cream for actual marshmallows? I think next time I will try putting a little more of the cake mix in there, I was hoping for a more amped up cake flavor. That being said, I used my own recipe for rice krispie treats which calls for more butter and more marshmallows so my ratio’s were probably off. Will definitely be making these again….I love all things cake batter flavored!! Such a fun idea! I used chocolate cake batter (because its what I had in the pantry) and I doubled the amount. Results were so tasty. Quite a treat! are you aware an Etsy seller has stolen your idea and your images for their shop? I do agree with all the concepts you have offered in your post. They are very convincing and can certainly work. Still, the posts are very quick for beginners. Could you please prolong them a bit from next time? Thanks for the post. You haven’t met me or my friend Minnie, but we talk about how when it comes to food that your recipes always win. Seriously. When we make your stuff, we get encores. I only have big marshmallows, can I use those and how would it convert? I made these to take camping with us, I couldn’t figure out a productive way to package them so we didn’t have a lot of waste form the packaging. I formed them into balls and put them all in one Ziploc bag and it worked perfectly!! Everyone LOVED them and I did not have to carry any of them home! How long do you think these will last if stored in an air tight container? I was thinking about shipping to a friend for her birthday, since I envision them to hold up better than cookies in the mailing process, but if I mailed them priority do you still think they would be too hard in 2-3 days? Pingback: 43 Variation of the Rice Krispies Treat | …………..365 Days of Eating in…………..